The Amy Scarf was originally knit for my Maid of Honor, Amy. We grew up together in Wisconsin, where a large, thick scarf like this is very useful in the winter! 07/03/2009: Fixed errors in row 17 of pattern instructions and KRL instructions. The sample scarf was knit with 6 skeins of Debbie Bliss Rialto with very little left over. If you wish to swatch or make a longer scarf, purchase an extra skein. Exact gauge for this project is not important. However, be sure to wash and block your swatch before checking gauge; Debbie Bliss Rialto may relax considerably after washing. Beautiful design – although I pulled hairs getting the pattern established. Guess it’s been too long since I knit a busy cable pattern. I’ve just finished the first full pattern and realize this needs to be a sweater. It is really too pretty to limit it to a scarf. I’ll have to beg help at my local knitting shop to take my measurements and write a pattern. Thank you for the lovely comments! And for letting me know about the typo. It’s on my list. If you turn the pattern into a sweater, please write back and let me know how it turns out! P.S. That would be “considering MAKING it” – should have proofed before pushing send LOL. – K.
I would recommend using the Rialto! It’s superwash and I think it comes in the colors you want. My comment about the yarn “relaxing” just means the scarf will grow in both width and length as the stitches settle, so make sure to wash and block a swatch in the cable pattern if you want an accurate idea of how big the finished scarf will be. Once the finished scarf has been washed and blocked, it will hold that shape just fine. This property is common to many yarns. 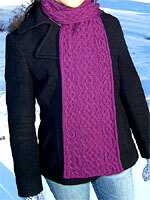 You’ll see Clara Parkes mention it often in her yarn reviews (e.g., her review of Karabella Aurora 8). It happens because of the way the fibers get compressed during the spinning and knitting process. Water makes them de-compress. It’s not something to worry about in terms of yarn quality (and from my experience, higher-quality yarns are more likely to do this), just something to be aware of if you want the finished garment to be a particular size. If you want to substitute a yarn, I wouldn’t recommend using anything heavier than DK weight, otherwise it will be bulky. Use a superwash wool-based yarn. Debbie Bliss Cashmerino DK would be a good choice, and Rowan/RYC makes several DK weight yarns that would be great as well. I used Rowan Cashsoft DK for the Red Herring Scarf and it’s held up very well over the years. I gave the original Amy Scarf away, so I unfortunately can’t comment on how well Rialto holds up over time, but Debbie Bliss yarns are great yarns and I wouldn’t hesitate to use one for any project. Hi, Love the scarf!! 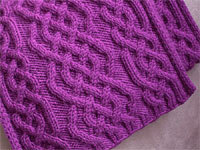 Just wanted to point out or actually ask… Row 5 of the cable pattern, the last stitch is p2, shouldn’t it be p4? It should be p2 — the scarf is symmetric and the written directions match the chart. Are you getting extra stitches?